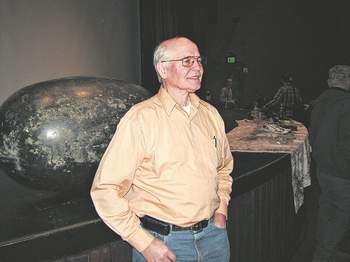 PORT ANGELES — The first piece of debris that could be identified as washing up on the West Coast from the March 11 tsunami in Japan — a large black float — was found on a Neah Bay beach two weeks ago, Seattle oceanographers Curtis Ebbesmeyer and Jim Ingraham said Tuesday night. Since then, the two researchers, known as DriftBusters Inc. — who have used flotsam to track wind and water currents in the Pacific since 1970 — have learned that the black, 55-gallon drum-sized floats also have been found on Vancouver Island. Ebbesmeyer and Ingraham spoke to more than 100 people at Peninsula College and brought the float with them, along with examples of other items that may be showing up on beaches in the next year. Tons of debris washed out to sea when a tsunami struck northern Japan after a massive magnitude-9.0 earthquake March 11. About a quarter of the 100 million tons of debris from Japan is expected to make landfall on beaches from southern Alaska to California, possibly in volumes large enough to clog ports, Ebbesmeyer said. Using models from a historic shipwreck that occurred 20 miles off Neah Bay, Ebbesmeyer and Ingraham have determined the path of debris that comes into that area off the Washington coast. They said debris will be snagged by currents leading into the Strait of Juan de Fuca and that a large portion of it will end up on beaches from the mouth of the Elwha River to Port Townsend. Many ocean models have shown that the massive congregation of flotsam that washed away from devastated Japanese coastal cities is in the middle of the Pacific and won’t make landfall in the U.S. for another year or two. Most of it is exactly where those models predicted, but those models don’t take into account wind and flotsam with large areas exposed to the wind, said Ebbesmeyer, who became famous for his and Ingraham’s ocean research into currents after large spills of Nike shoes and bath toys from container ships in the 1990s. Flotsam in a current travels an average of seven miles per hour, but it can move as much as 20 mph if it has a large area exposed to the wind, he said. The float that was found in Neah Bay sits well above the water, has a very shallow draft and is lightweight, exactly what Ingraham’s computer model said would show up first. It was found by Surfrider beach cleanup crews working on a Makah-owned beach on the strait, a few miles east of Neah Bay, Ebbesmeyer said. The black floats are seen in the middle of the Pacific by the hundreds, and are not something that has been seen on Eastern Pacific beaches before, he said. The floats are included in masses of black blobs supporting huge rafts of debris that include fishing boats, houses and possibly human bodies, Ebbesmeyer said. Many of those bodies and parts of bodies will likely begin washing up in about a year, some simply as feet in athletic shoes, similar to those found in Puget Sound over the last decade, he said. Ebbesmeyer has done extensive research on those feet, and said that many more may be found in coming years. Athletic shoes make the perfect floats to preserve parts of bodies, Ebbesmeyer said, and there are still thousands of people missing from tsunami-stricken areas of Japan. Shoes with remains or other possibly human remains found on beaches should be reported to the appropriate authorities, either police, sheriff’s deputies or park rangers, he said. If the debris has any kind of identifiable marking, such as numbers or Japanese writing, it may be traceable, Ebbesmeyer said. “All debris should be treated with a great reverence and respect,” he said. Families in Japan are waiting to hear of any items that may have been associated with their loved ones and may travel to the U.S. to meet those who found these mementos, he added. Items that wash up may include portions of houses, boats, ships, furniture, portions of cars and just about anything else that floats, he said. The rafts of debris include whole houses which may still contain many personal items, and the Japanese are known for storing important personal mementos in walls, Ebbesmeyer said. Even the smallest of traceable items may be the only thing associated with one of those people who were lost during the disaster, he said. Contact Ebbesmeyer at CurtisEbbesmeyer@comcast.net for assistance in translation and to track tsunami debris back to its Japanese origins. “I have a translator to read things in Japanese,” he said. Large items still in the water should be reported to the Coast Guard, as they may represent a hazard to boats and ships, he said. The event was unprecedented, and no one knows yet what levels of radiation, if any, items have picked up, he said.